Another card for a coworker who helped me out recently. 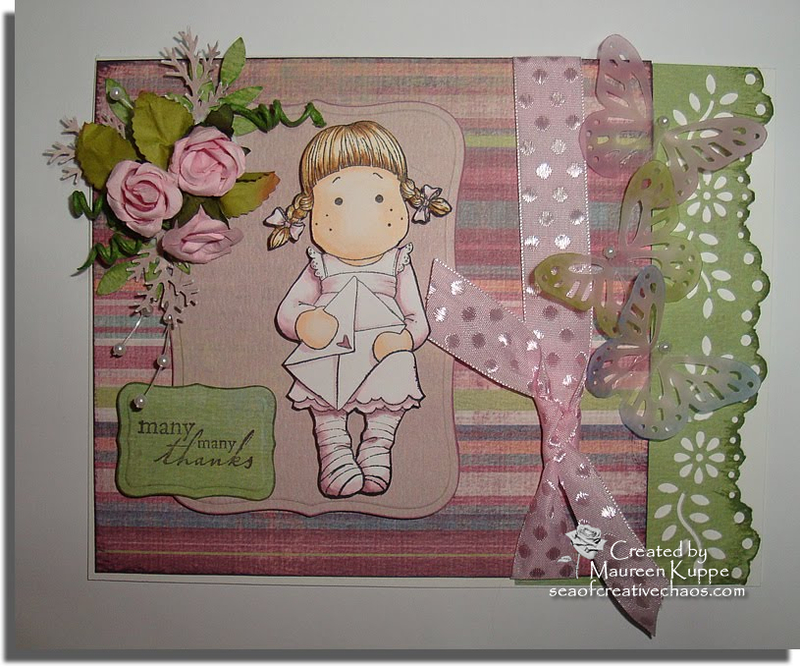 I love this paper and have used it before, unfortunately it no longer had the make on the piece I had leftover! To coordinate with the paper, I used yellows, browns and purply-blues. Tilda is dressed in the purply-blue, even though this photo shows it as more blue toned. First I sewed the background patterned paper onto Bazzil cardstock.Then I added some cotton lace ribbon I found at Dollarama and a paper doily and inked them both with new Stampin' Dots Barely Banana colour. Yellow roses and cala lilies are from the Bridal section at Michael's. A final touch of brown was added in the form of punched out oak leaves from Martha Stewart. Tilda and the sentiment are both raised on foam dimensionals for some added interest. With Canada Day coming up on July 1st I was feeling particularly patriotic... I had a card in my mind that I wanted to create so I spent today immersed in red and white! "Happy Tilda" was coloured using Copics and raised on foam dimensionals over "grass" made with Ultrafine Sage Flowersoft. One tradition on Canada Day is for kids to paint red Maple Leafs on their faces; so I gave Tilda one too. Her Canada Day shirt is decorated with a Maple Leaf sticker. She is holding a flag I removed from a little Canada Day doll we've had forever but never really displayed. The background is a Government of Canada postcard I picked up at a Canada Day celebration a few years back. Yep, I raided my Canada Day decor stash for this card! Over the background I wanted to portray fireworks. 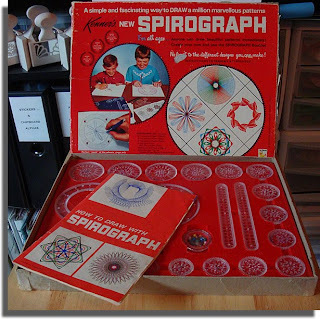 Well, I got out my vintage Spirograph! What fun it was to use my Zig Millennium pens to create a few colourful bursts. 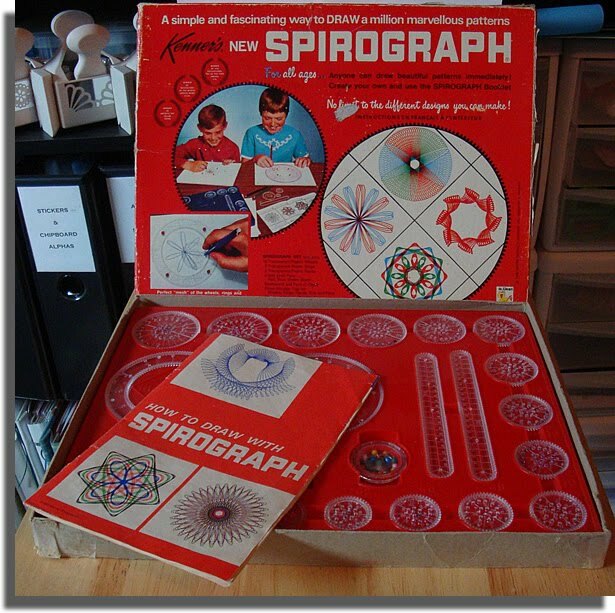 (And yes, it DID take me a few tries to get the hang of it again; I haven't used it in a few years). The center burst is also popped up on foam dimensionals. The fireworks trails are made with Westrim Crafts Rhinestone Accent Flourishes. The centers of the bursts were filled in with silver Stickles for more sparkle. Inside the easel card I added a red rose from Dollarama Crafts, and two white roses from Modern Romance at Michael's, all three given a dose of sparkle with silver Stickles too. The sparkly red paper is something my daughter picked up from Michael's years ago, so unfortunately the piece that was left didn't have the make on it. A simple white satin ribbon from Offray finished it off. 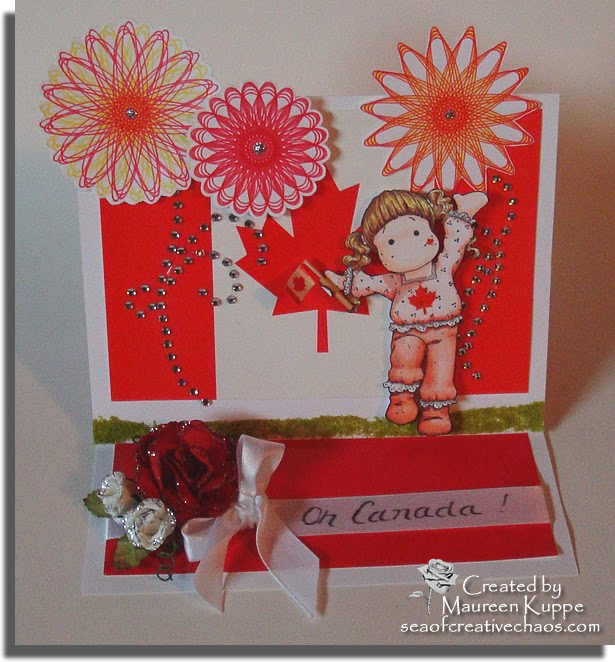 Happy Canada Day to all my Canuck friends! Don't forget to check out my DigiDrawn digital stamp site. 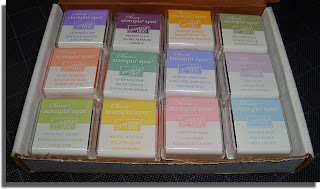 I am pleased to announce I have sold a few stamps already! If there is anything you would like to see made into a digistamp, please let me know! 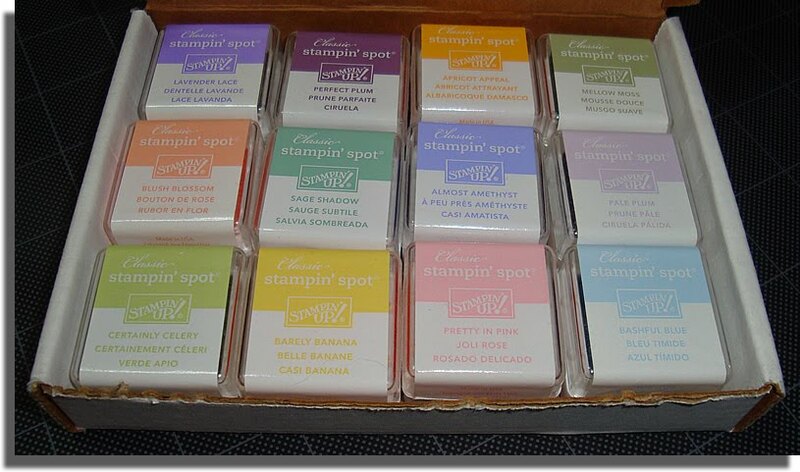 "I was cleaning out my house and I've never used these.... they're not even opened, so I thought you might be able to use them..."
To my surprise, I opened the box to reveal 12 wonderful Stampin' Up Stampin' Spots! These awesome water based ink pads were still perfect; not dried out at all. So of course, I just HAD to use them to make her a thank you card, with a monetary gift tucked inside. 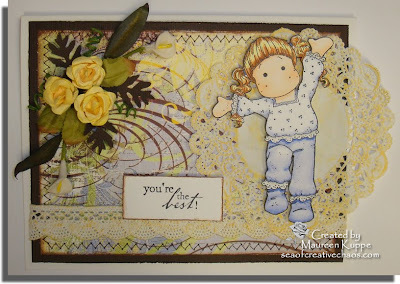 I started out using a Tilda With Letter stamp coloured with Copics. 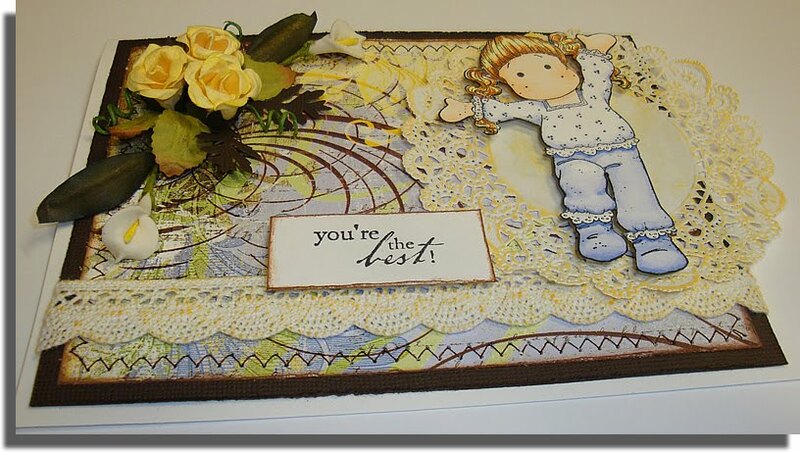 Using My Mind's Eye papers "29th Street Market Carefree Precious Pretty Petals and Baby Blanket", I edged all the layers with my new inks, including the one punched with my Martha Stewart floral edge punch. A pink polka dot ribbon was added and I cut two mats with my Cuttlebug and Spellbinders dies. I used my Martha Stewart butterfly punch on vellum and dusted them with ink. The colours I used were Perfect Plum, Pale Plum, Mellow Moss, Bashful Blue and Certainly Celery. Each one then got a pearl head. A few paper roses and pearl sprays from Michael's "Modern Romance" line in their Bridal department along with MS Pine Branch and Leaves punch-outs (stained with some more Stampin' Up inks, natch) finished it off. On a side-note, I've added a few more images over at DigiDrawn! If you want a couple of accessories for your Pirate-themed cards, you may just want to take a look! I decided to "Bling It!" 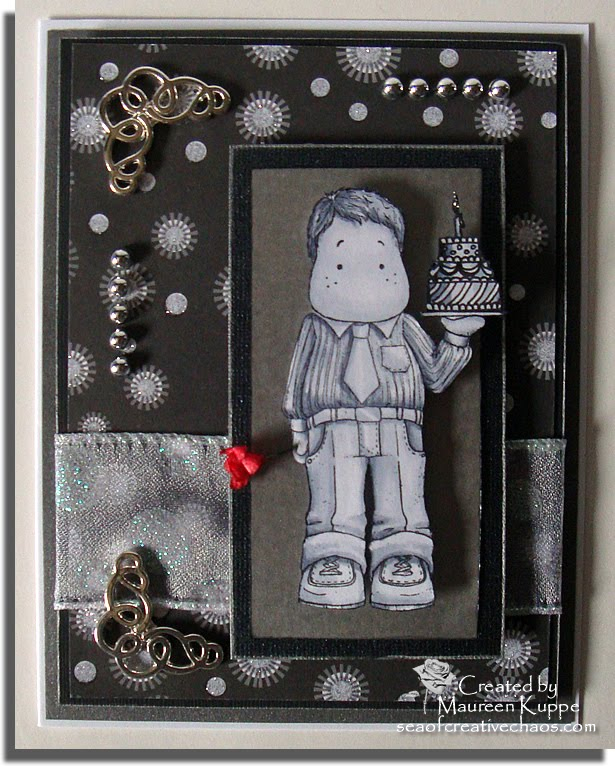 this week -- I created a monochrome, but definitely blingy birthday card featuring Bartender Edwin... except I've removed his drinks and replaced them with a birthday cake. Here are two photos; the first one above taken with a flash to show off the bling, the second below without flash to show the shading created by the three layers. First I raised the background on foam, then I added foam dimensionals to the mat under Edwin. Finally, the third layer is Edwin himself, raised on smaller foam dimensionals. The bling on the card includes paper from DCWV's Glitter Stack. Three layers of papers are metallic. 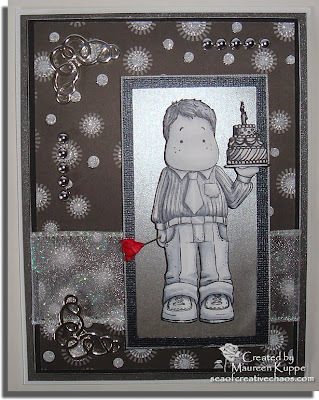 Two layers are edged with Encore Silver Metallic ink. Two silver brads are Scrapmetal Corner Swirls by Autumn Leaves. Ten silver self-stick brads were also used. A sheer white glitter ribbon was run through two layers. 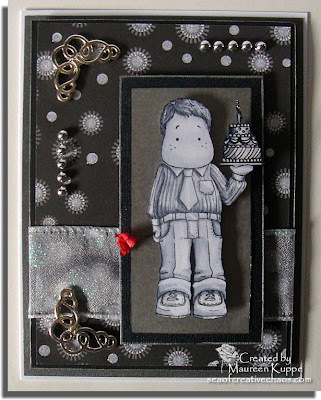 A final touch of bling was added to the candle flame with silver Stickles. 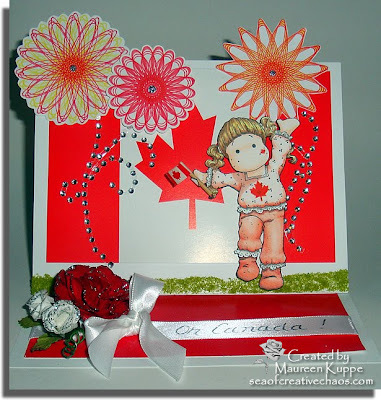 The only colour on the card, the red flower, was a Dollar Store item coloured with an R29 Copic. Copics used on Edwin: C0, C1, C2, C3, C5 and C10. And now to the New Venture. In the past few months I have been so overwhelmed with the incredibly nice comments about the extra objects I draw for my cards. I have even mailed out a couple of drawings to others. So, after a week of setting up a new site for them, I have started a blog called DigiDrawn to sell my drawings as digital stamps. Along with the objects I have done to accompany my Magnolia stamps, I will also have other drawings for sale as stamps too. I would love to invite everyone to visit; even if you don't purchase, let me know what you think. I've never done anything like this before... so I guess we'll see how well it goes. I have seven stamps up so far, with more to come soon. I hope to see you over there!